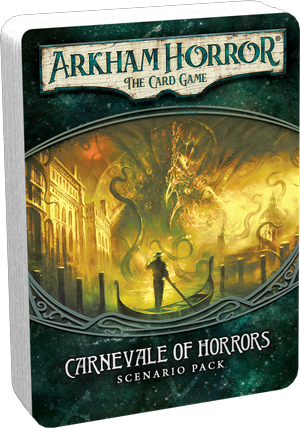 Now available via FFG's in-house manufacturing, Carnevale of Horrors is a new, sixty-two card scenario for Arkham Horror: The Card Game that may played standalone or may be added as a "side-story" to your ongoing campaign. 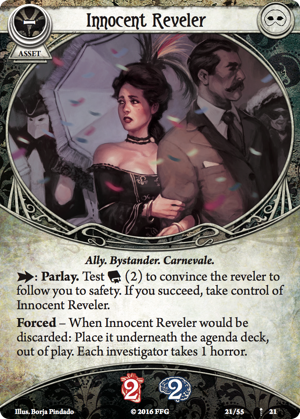 Its mysteries lead you and your fellow investigators far from the quiet, New England shores of Arkham. You'll cross the Atlantic and partake in the Carnevale of Venice. But while this festival begins with music, mirth, and merriment, it quickly spirals into abject horror. The sun vanishes, and screams erupt throughout the city. You want to save as many innocents as you can, but everyone is wearing masks. Who are the villains, and who are the victims? 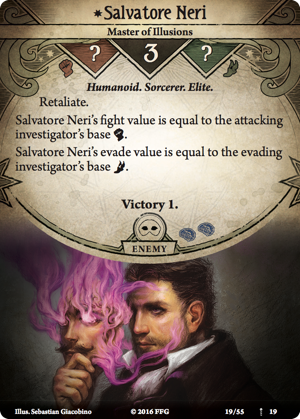 In this Carnevale of Horrors, you must race quickly through the layers of mystery and conspiracy, lest the cultists and their sacrifices summon a being of unfathomable malice! Held annually during the ten days leading up to Shrove Tuesday, Carnevale di Venezia is a celebration famous for its music and its masks. Participants parade through the streets with excessive celebration before their Lenten fasts. 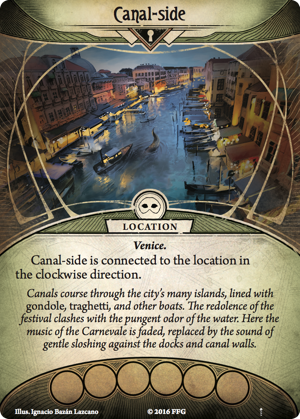 On its surface, Carnevale is a vibrant and colorful spectacle that runs throughout the entirety of the city, along crowded streets, over bridges, along the Canal-side (Carnevale of Horrors, 9), and past many of the city's most beautiful buildings. However, there's something odd about this year's celebration. Although it has been a part of the city's cultural identity since the 11th century, Carnevale has been in decline since it was outlawed by the King of Austria in 1797. So why has the celebration now returned to Venice in such strength? Is there a sinister plot behind its return? Additionally, there's the fact that the festival is almost synonymous with its masks—masks that conceal the identities of all those who wear them. And while each type of mask is steeped in tradition and laden with meaning, you'll be more concerned that as you're scouring the city for clues, they make it nearly impossible to tell an Innocent Reveler(Carnevale of Horrors, 21) from a sinister cultist like Don Lagorio (Carnevale of Horrors, 17) or Salvatore Neri (Carnevale of Horrors, 19). 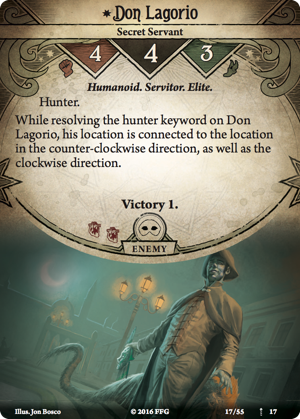 Accordingly, throughout Carnevale of Horrors, you'll be challenged to navigate the parade of Masked Carnevale-Goers traveling clockwise from location to location. 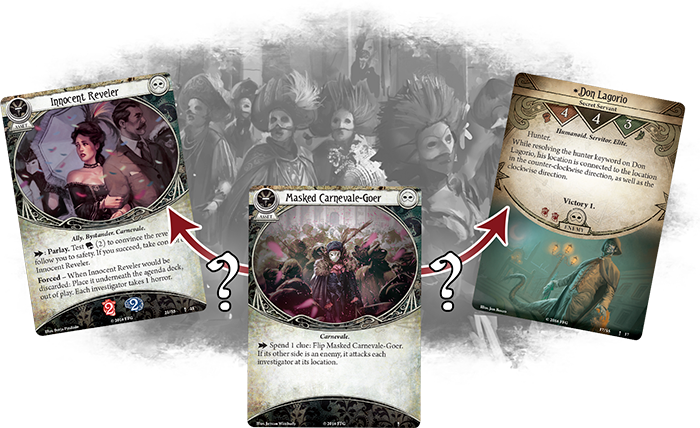 You'll need to be careful as you try to discern the identity of each different Masked Carnevale-Goer, and you'll need to use that information to prevent the city's conspirators from ushering forth a new age of darkness and despair. 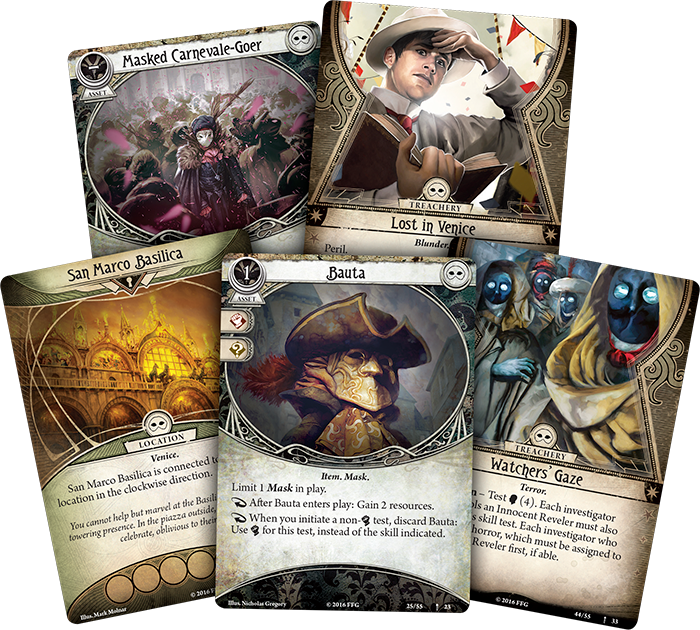 Carnevale of Horrors comes with all the act, agenda, location, and encounter cards that you need to enjoy its adventure as a standalone adventure or as a side story in your ongoing Arkham LCG® campaign. 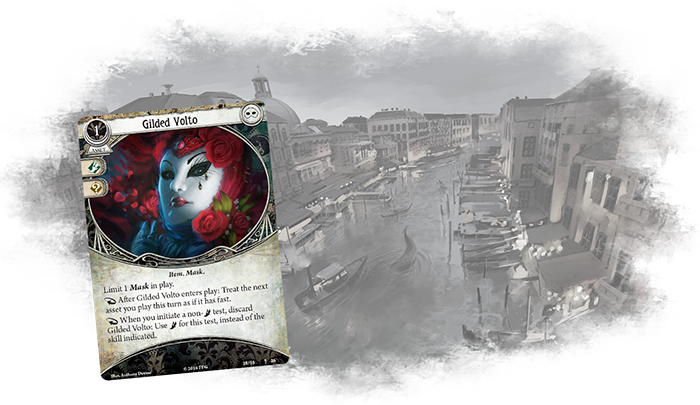 Additionally, it comes complete with rules and five player cards—one ally and four Mask assets—that you can only add to your deck after concluding your investigations in Venice.